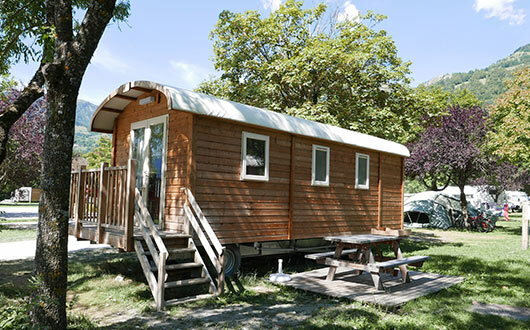 The Beaufortain has retained all its Alpine authenticity, with a landscape dominated by traditional pastoral activities. 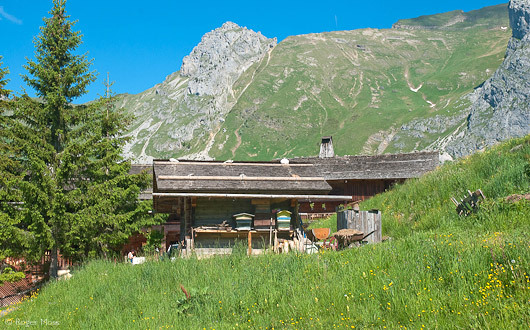 There are typically Savoyard picture-postcard chalets and steep Alpine pastures where the hay is often still cut by hand. The massif is home to turquoise blue lakes, flower-filled alpine meadows and herds of the local ‘Tarine‘ cows, bells-a-tinkling… a timeless cliché of the Alps. Beaufort cheese, ‘Prince of Gruyère’ is produced here at the cooperative, and it’s well worth a visit to learn how it’s made, and to buy some for your picnic or to take home. The Beaufortain massif is located in the Savoie department of France (adjacent to the Mont-Blanc massif). 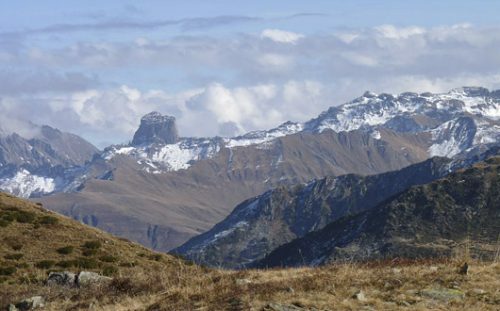 The area is bounded by the Tarentaise valley to the south, the Val d’Arly and the Nant-Borrant, the culminating point being Le Rognais at 2995m. The main village is Beaufort, nestling in the Doron valley. All the necessities of life are available here, along with a couple of hotels. Beaufort cheese – ‘Prince of Gruyère’ is produced here at the cooperative, and it’s well worth a visit to learn how it’s made, and to buy some for your picnics or to take home. 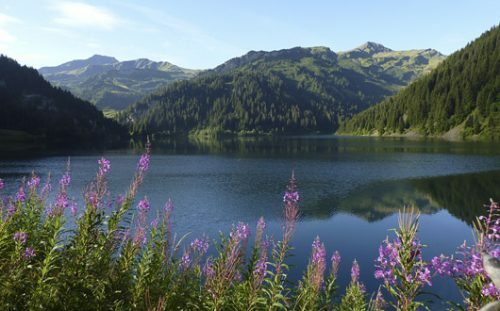 The Beaufortain has a number of large lakes: the Lac de Roselend, Lac de St Guérin, La Gittaz and La Girotte. The lakes are all dammed and linked by underground tunnels (large enough to ride a bike through) to hydro-electric power stations. The Lac de Roselend’s dam was built in 1961. The route described starts from the hamlet of Molliessoulaz (there’s a gîte here) above Queige on the principle route from Albertville to Beaufort. The path leaves Molliessoulaz and climbs steadily through pine woods before arriving in Alpine pastures. From here the path gains more height, leaving the woods behind to arrive on an impressive ridge close to La Roche Pourrie. From here the view over the Combe de Savoie and the Basse Tarentaise spreads out before you, with a ridge running up to the summit of the Mont Mirantin and then away towards La Grande Journée. The route now loses some height before continuing in a rising traverse to the aptly-named Col des Lacs. It’s a good time for a pause to drink in the view. 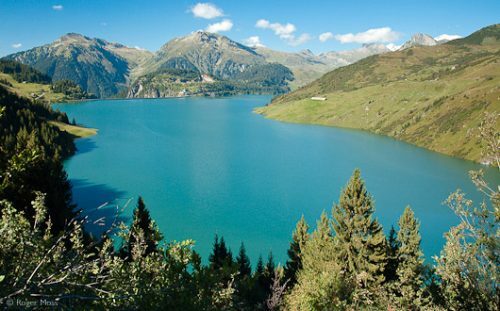 The route now passes close to the Lac de Lavouet before joining a track and path that leads to the Col de la Bathie. 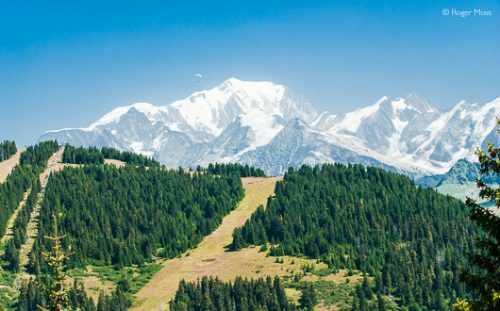 Mont-Blanc’s startling white summit is visible in the distance. From the Col de la Bathie you can look down towards the village of Arêches. The refuge is set just above the trees close to a few of the ski lifts coming up from Le Planay. The route traverses below the bulk of the Grand Mont and the Pointe du Dard before reaching the Chalets des Rognoux. Lac de St Guerin’s turquoise waters beckon below and the route now descends gently through pine woods and pastures to its shores. The path now leads up steadily amongst the alpages to reach the Refuge Econdu (privately owned) below the Cormet d’Arêche. The other alternative is the Refuge de la Coire just past the Col. Leaving the Refuge, rejoin the main path and pass the Lac des Fées (fairies) before reaching the Cormet d’Arêche (Cormet is the local word for a pass or a col). From here follow a track and then a path to the Col du Coin (2398m). Time for a break to take in the view. To the right is the famous Pierra Menta, a dramatic rocky peak which gives its name to a famous annual ski-mountaineering competition. 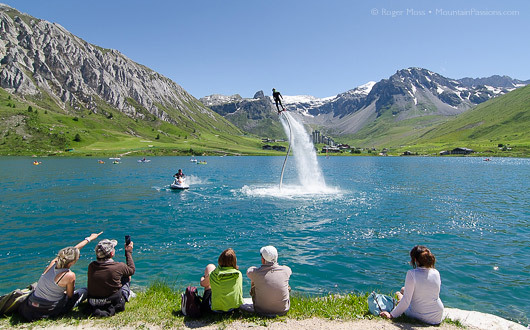 Lac de Roselend’s azure waters sparkle below. Our route now descends slightly with the Pierra Menta standing assertively above. It’s also possible to take a more contouring route via the Lac d’Amour, passing right next to the Pierra Menta, although with a very steep initial descent the far side. 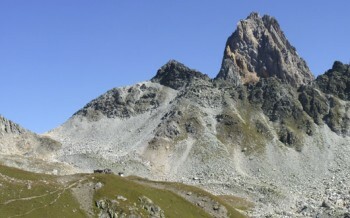 Once on the Col du Bresson (2469m) you can see the refuge on a small promontory. 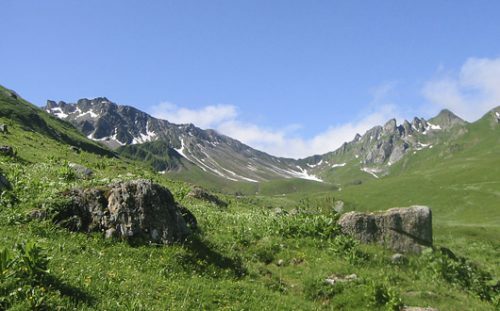 The path cuts across the hillside and a final small climb brings you to the Refuge du Presset. Nestling beside a small lake with mountains all around, it’s great place to spend the night. Skirting the lake, a short climb leads to the Col du Grand Fond, with the Aiguille de la Nova (2890m) dominating the skyline and the Combe de la Neuva stretching out below. The route follows the valley with mountain ridges standing sentinel to either side; keep a look out now for chamois or bouquetin. Reaching a small water intake, pick up a track which contours the hillside to the Cormet de Roselend, one of the celebrated cols of the Tour de France and part of the Route des Grandes Alpes. The road to the left leads back down to Albertville or onward to Bourg St Maurice. Crossing the road, we pick up a track which soon peters out, while we make our way up to the Col de la Sauce (2307m) and avoid following the road to the Plan du Lai. From the Col de la Sauce follow close to the crest of the Crête des Gittes on a path hewn out of the rock before WWI by soldiers who left a lasting testimony to their endeavours with engraved memorials. The night’s stop is now in sight – the Refuge du Col de la Croix du Bonhomme, a large modern refuge which also serves the Tour du Mont-Blanc. The route is now common with that of the Tour du Mont-Blanc, passing the Col du Bonhomme before descending towards La Balme. However before reaching La Balme a path now diverges passing below the Col de la Fenêtre, the Aiguille de Roselette and opposite, the satellite peaks and glaciers of Mont Blanc dominating the skyline. After the path crosses a boulder-field it starts to climb again and soon reaches the Chalets de Roselette (refuge) below the Col du Joly with the valley of Les Contamines below. Follow the broad ridge briefly before following a path which clings to the hillside below the Aiguille Croche and comes out on the ridge again near the Col de Véry. 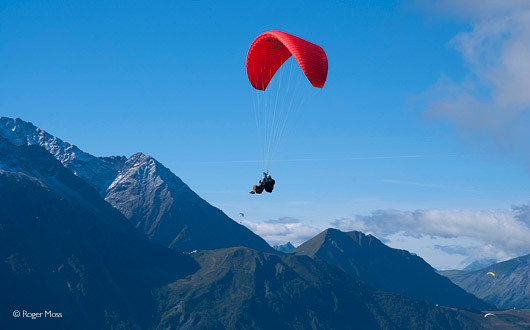 The route now goes via (optional) or close to the Mont de Vores and then Mont Clocher following the broad whale-back ridge overlooking the Val d’Arly and the valley of Hauteluce. The final section goes via the Chard du Beurre, passing above the resort of Les Saisies, to the Chalet de Lachat. Les Saisies hosted the biathlon and other cross-country skiing events during the 1992 Winter Olympics. The Tour of the Beaufortain continues, mainly through pinewoods, below Mont Bisanne before a steep descent among increasingly deciduous woodland, to arrive back at our starting point, in the village of Queige. Mark has over 30 years experience of professional guiding and is a fully registered mountain guide who lives and works full-time in the Savoie region of the French Alps. He offers walking and trekking holidays, guided cycling, rock-climbing and snowshoeing as well as the popular sport of via ferrata. You should only require 'normal' mountain walking attire plus a sheet sleeping bag for using in the refuges. You can read an article here on staying in mountain refuges. 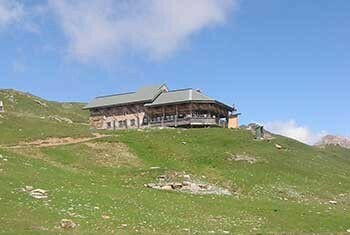 Ideal stopover on the tour, the refuge is at 2059m altitude and open all summer for accommodation and meals. 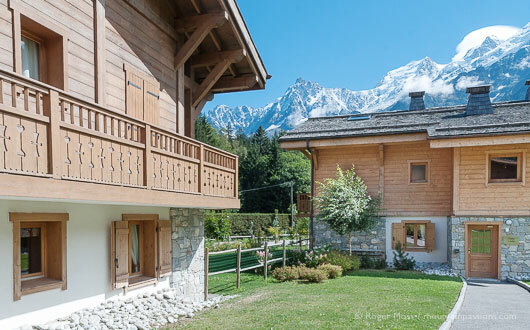 Situated at Les Contamines-Montjoie, the auberge is open for lunches and for overnight half-board accommodation. Summer opening: early June - end September, check website for details. The main limiting factor is availability of the mountain huts (refuges); the second, in the spring, being the snow remaining from the winter. The refuges normally open around mid-June and they typically close in mid-September despite the weather often being good at this time of year.